And that [this land] was the place of the New Jerusalem, which should come down out of heaven, and the holy sanctuary of the Lord. … And he spake also concerning the house of Israel, and the Jerusalem from whence Lehi should come … And that a New Jerusalem should be built up upon this land, unto the remnant of the seed of Joseph. Moroni used Ether’s words to emphasize how these holy cities will play an important role in the last days, as the earth is renewed before Christ’s millennial reign and also after the Millennium when the earth is once again renewed, or transformed, into a celestial realm (Ether 13:3–8). The Lord told the apostle John to write “the name of the city of my God, which is new Jerusalem, which cometh down out of heaven from my God” (Revelation 3:12). Later in his vision, John “saw the holy city, new Jerusalem, coming down from God out of heaven” in which God would dwell with men on earth (Revelation 21:1–5). The Epistle to the Hebrews mentions how Abraham, while he was wandering in the land of promise, living in tents, “waited for the city which has foundations, whose builder and maker is God” (Hebrews 11:10, NKJV). Ezekiel saw, in a very detailed vision, the New Jerusalem and its temple as they would be in the latter days (Ezekiel 40–48). A number of apocryphal/pseudepigraphal texts, including 1 Enoch, 4 Ezra, and 2 Baruch, depict the coming of the New Jerusalem with its glorious temple. A fragmentary text labeled “The New Jerusalem Scroll,” found among the Dead Sea Scrolls, gives details of a vision of the city and temple that God will build in the end of times. In the text, an angel provides details regarding the measurements and appearance of the temple city, much like the revelations given to Ezekiel and John but with some differing details. Although the description of the heavenly New Jerusalem coming down to earth found in the New Testament book of Revelation is, perhaps, the best known to modern readers, the fact that a number of the above-mentioned texts were written before Revelation indicates that a belief in a heavenly or “new” Jerusalem is not limited to that book but has been held among believers for much longer. The “New Jerusalem” is a type. A type is a class, a thing that symbolizes or exemplifies an ideal. Types are repeatable. Thus, we see the city of Enoch, Melchizedek’s Salem, Jerusalem, the New Jerusalem, Zion — all of these holy cities are temple cities where the Lord’s chosen people can live as one, unified in their love of God and one another. The hope of “Zion,” the city of God, has been held by many prophets and believers throughout time (as discussed previously). The author of Hebrews was aware of a traditional belief that Abraham and other early patriarchs and prophets had been seeking or waiting for “the city which has foundations, whose builder and maker is God” (Hebrews 11:10, NKJV). It is natural, then, that the idea of a New Jerusalem should be found in multiple sources. Ether 13 should be seen as not merely an echo of one tradition, such as that found in Revelation 21 but as a representative of the strain of New Jerusalem traditions that can be found throughout ancient religious texts. For example, although Ether mentions the New Jerusalem coming out of heaven, the new heaven and new earth, and the inhabitants whose garments are made white through the blood of the Lamb (see Revelation 7:14), which are mentioned in John’s revelation, there are many differences between the two texts. The bridal imagery found in Revelation is not present in Ether, nor are the descriptions of the appearance of the city. John does not include any of the references to the remnant of the seed of Joseph, that they would inherit the New Jerusalem, to be built on the American continent (Ether 13:6–8). The New Jerusalem motif in Ether should be seen as a unique representation of this tradition that, in some ways, parallels a number of others. The New Jerusalem is the name of a divine place, a name that reflects the characteristics of other divine names and titles. Divine qualities and titles are often expressed in plurals and superlatives. For example, one divine title for God the Father is Elohim, even though the word “Elohim” is technically plural. However, the word elohim in Hebrew is plural and actually means “gods”— those who share the characteristic of being divine. Calling the Father “Elohim” can make reference to the plurality that exists in the Godhead, or the divine council, and it can also be a reference to the superlative nature of God’s divine qualities. Similarly, the New Jerusalem can refer to a specific place —the city of God— but it is also a title that can be applied to multiple sites that share the characteristic of being a holy city. The New Jerusalem refers to the abode of God. The Christian believers mentioned in the Epistle to the Hebrews were seeking —and reached— the heavenly city of God, where the Father and the Son dwell (Hebrews 12:22–23). Enoch and his city were caught up to heaven, into the “bosom of the Father” (Moses 7:24, 31, 69). Those who are brought up into the dwelling place of God are in Zion, the New Jerusalem. Likewise, when God condescends to dwell with mankind, that place is also Zion, the New Jerusalem. One point needs to be emphasized. At the center of John’s new vision lies a city—a place where families dwell. Indeed … the city actually represents celestial society. … The celestial kingdom is a community or system of communities presided over by an eternal Father and inhabited by his children, organized according to family units under the divine patriarchal order. Celestial beings, the Church of the Firstborn, function within this family order. Thus, the city represents the ideal and perfect community that is the eternal family of God. The preservation of these holy cities, from before the Second Coming and on into the eternal, celestial existence of this earth, is a major fulfillment of the Lord’s promises to Abraham, Isaac, and Jacob — to their family. The Lord had promised that He would redeem Israel, both spiritually and physically, by bringing them back from their dispersion into the lands promised to them as an inheritance. The story of these multiple Jerusalems is the story of Zion. Whether old or new, in the Americas, the old Holy Land, or awaiting in heaven, Zion is the epitome of how blessed the children of God can be when they live in harmony according to God’s laws. If people learn to live as “one” after the manner of Zion, then they can be assured of the protection and preservation that the Lord has promised to the people of that will eventually inherit these holy cities. Jeff O’Driscoll, “Zion Zion Zion: Keys to Understanding Ether 13,” in The Book of Mormon: Fourth Nephi Through Moroni, From Zion to Destruction, eds. Monte S. Nyman and Charles D. Tate, Jr. (Provo, UT: Religious Studies Center, Brigham Young University, 1995), 215–234. Graham W. Doxey, “New Jerusalem,” The Encyclopedia of Mormonism, 4 vols., ed. Daniel H. Ludlow (New York, NY: Macmillan, 1992), 3:1009. See, e.g., Bruce R. McConkie, Doctrinal New Testament Commentary, 3 vols. (Salt Lake City, UT: Bookcraft, 1973), 3:582. 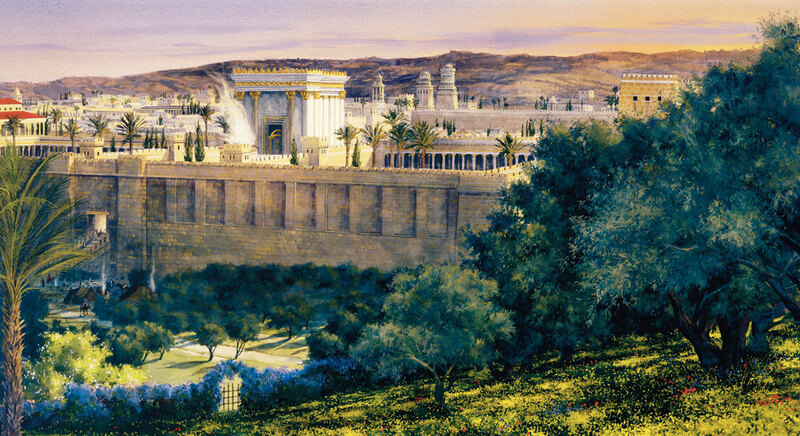 He further indicated that Gentiles who joined the Church would be numbered among the “remnant of Jacob” and help in building the city called “the New Jerusalem” (3 Nephi 21:23–24). The text goes on to imply that all of the patriarchs were seeking to reach, or return to, a country or a city—a heavenly city (Hebrews 11:13–16). Hebrews 12:22 associates this city with Mount Zion. Speaking to a community of Christian believers, the author declares, “But ye are come unto mount Sion, and unto the city of the living God, . . . and to an innumerable company of angels, To the general assembly and church of the firstborn, which are written in heaven” (Hebrews 12:22–23, KJV). Parts of this text were found on various fragments from the Qumran caves, including 4Q554–555, 5Q15, 11Q18, 1Q32, and 2Q24. Similar subject matter is found on the “Temple Scroll” (11Q19). For more on this, see Michael O. Wise, Martin G. Abegg, Jr., and Edward M. Cook, The Dead Sea Scrolls: A New Translation (New York, NY: HarperOne, 2005), 557–563. See, e.g., Revelation 21:3; Moses 7:62–64; Ezekiel 48:35; Ether 13:3. Richard D. Draper and Michael D. Rhodes, The Revelation of John the Apostle (BYU New Testament Commentary; Provo, UT; BYU Studies, 2016), 793–794.